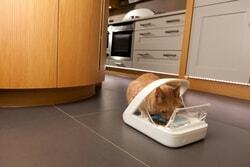 Automatic food dispenser for pets is a high quality and uniqe device with a built-in microchip reader. 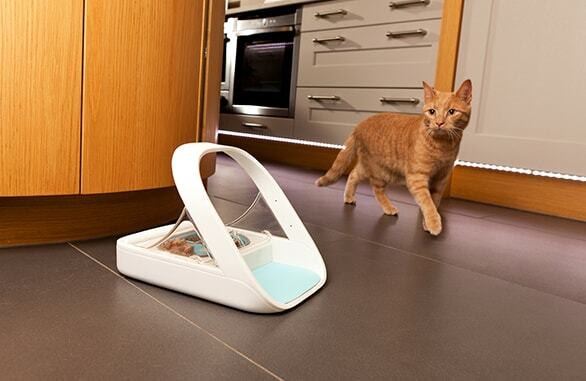 The reader recognizes a microchip that your pet already has, when it approaches the feeder. 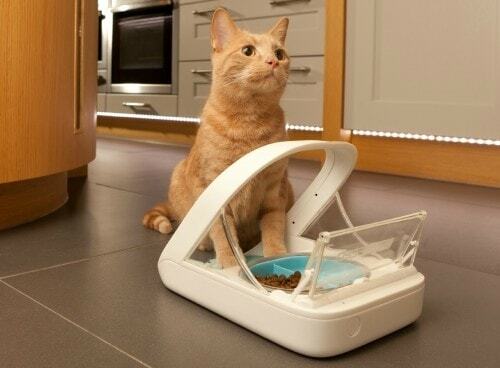 It then opens the lid and allows pet to the food. 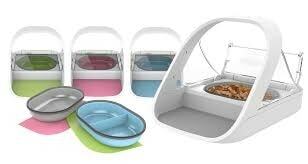 It is especially valued by the pet lovers that own more than one pet. It has the capacity of 400 ml, it's original, modern and looks good in every interrior. 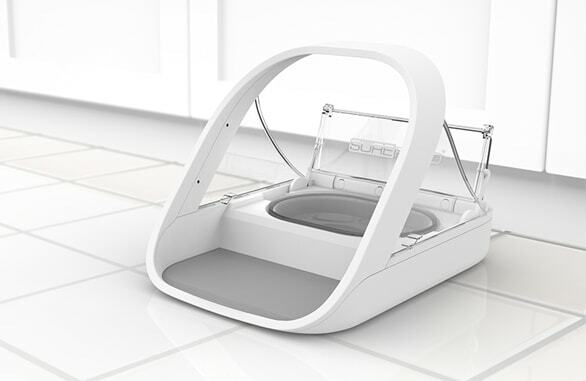 SureFeed is a uniqe, fully automatic pet bowl made in United Kingdom, which helps you to measure the food for all your pets. 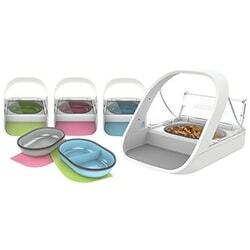 It is especially useful in the households with more pets, for example if some of them has a special diet, has to take some medication or needs different food than the other pets. It's usually very difficult to control how much food which animal eats. 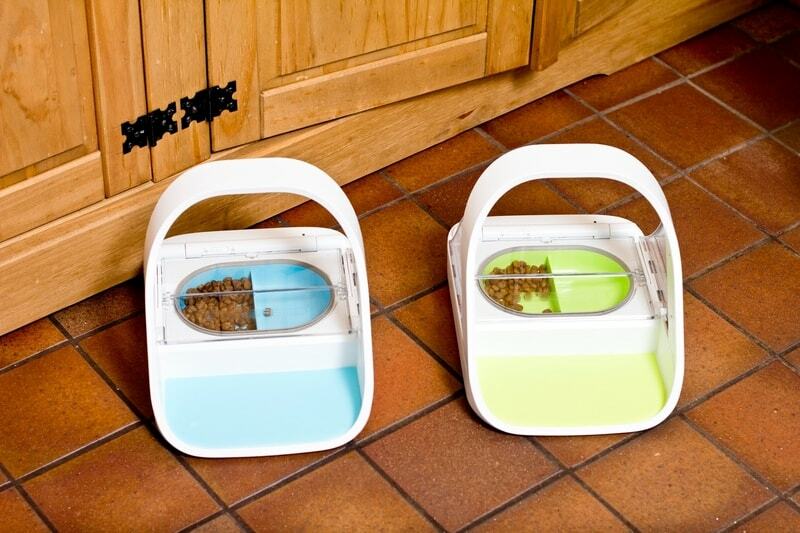 Thanks to the SureFeed bowl you don't have to worry that your pets will steal each others food anymore. 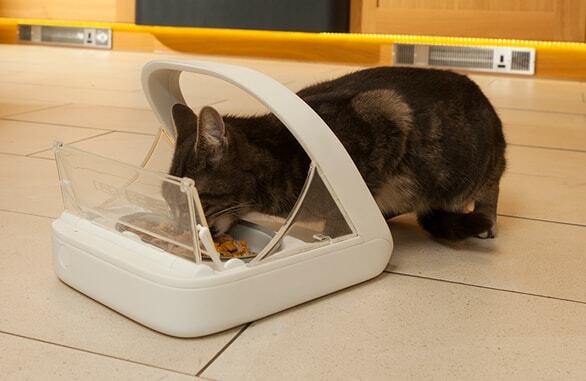 The food dispenser is a perfect solution for the owners of both cats and dogs. 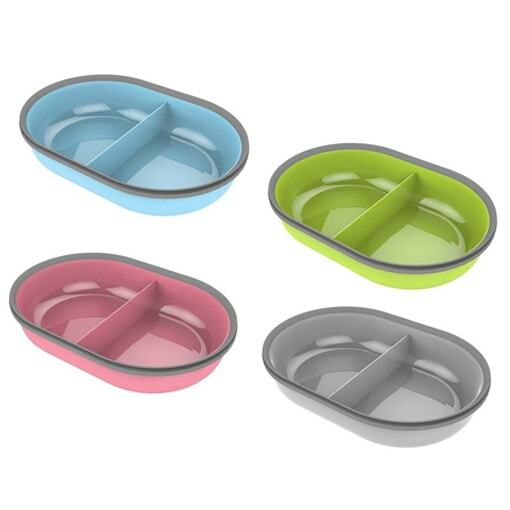 Capacity up to 400 ml - whether you feed your pet with wet or dry food, it will remain fresh inside the bowl. Unique design - the bowl is not only very practical, byt also stylish and fits into every household. Batteries last up to six months - it is not necessary to change them too often. The bowl has a memory for up to 32 pets - if you want to, you can comfortably feed each animal separately in its own bowl. 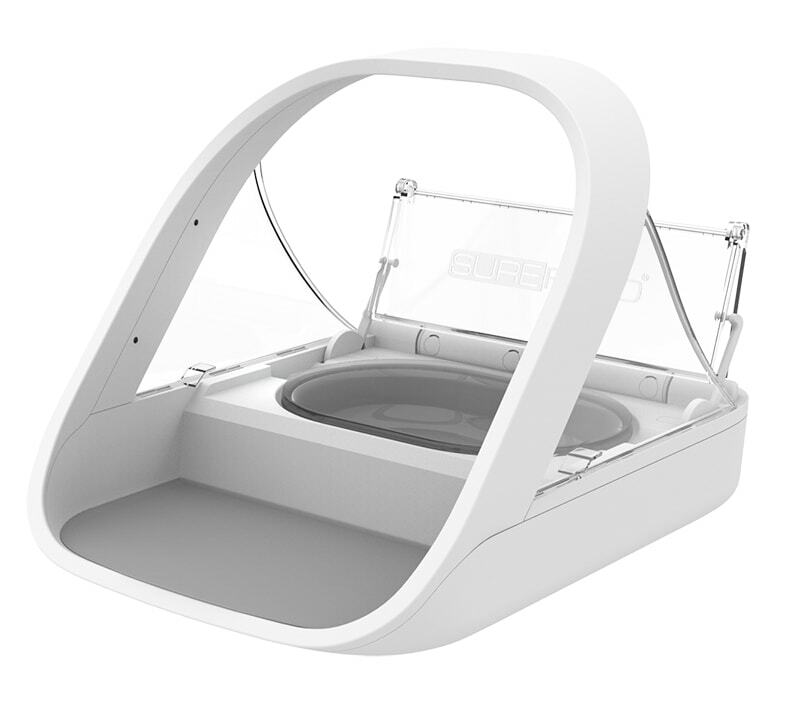 Compatibility - the microchip reader inside the SureFeed pet bowl is compatible with all known types of microchipes used for pets. 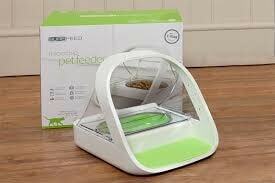 Ideal for dogs and cats that have a prescription diet or have to take some medication. 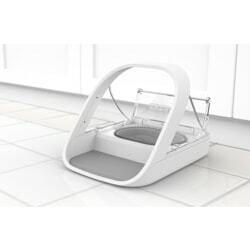 Training programme - the bowl allows you to use a special training programme that helps you to teach your pet to use the feeder. Button for the opening the lid - in case you need to, you can open the lid manually, by pushing one button. How does the SureFeed bowl work? 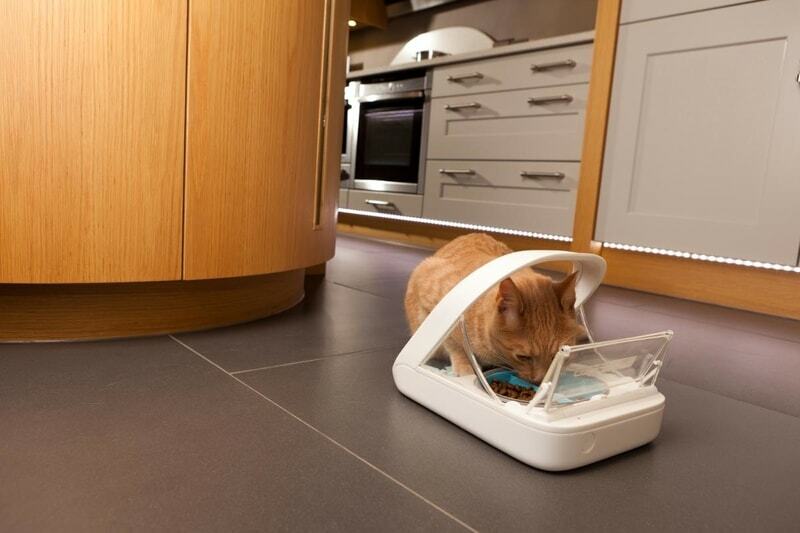 The food dispenser works with the microchip and a microchip reader. 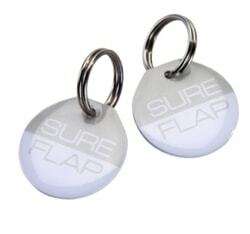 The microchip is either already under the skin of your pet, since this can only be done by a veterinarian, or you can use the collar tag SureFlap RFID. The microchip reader reacts to the presence of the chosen pet and let's only this pet to eat the food in the bowl. 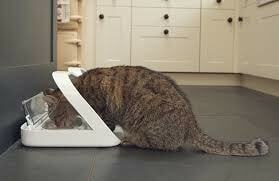 Each of your pets will only get the food that is meant for it. You don't have to worry that any of them would eat something that it's not allowed to. 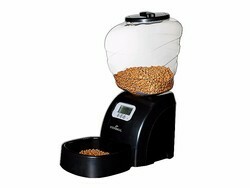 When the pet leaves the area of the feeder, the lid closes automatically. You can choose between three types of speed of the closing. 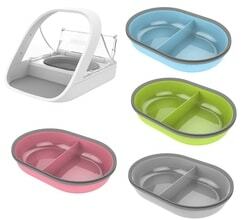 Upper edge of the bowl are specially sealed so that both wet and dry food stay fresh for a long time. Determining suitability for a particular dog is always very difficult, because every dog is different. Mainly depends on the temperament and sensitivity of the dog. Based on our experience, we recommend this model for these breeds. When shopping in our shop have a 30-day option to free loan product. If you are not satisfied with the product, you can submit it back for free and without giving any reason to come back and we will immediately send the money back. The collar can be tried, but can not be damaged. By law, the standard warranty on the goods two years. For some products, we have extended the warranty to 3 years. In case of any defect or failure of the product will be promptly repaired or replaced with a new piece. Compared to competing businesses we offer our customers a superior claims. If we have a product in stock (the availability of the product is always listed) and order is until 15:00, we will send you the goods that day. In most cases, the goods will be delivered within 48 hours from ordering. Above all, it depends on what you choose payment and shipping method. Free shipping for orders over 200 USD worldwide. Delivery is usually next business day after shipping (depending on the disposition of the carrier). We are the largest specialized shop with electronic collars in Central Europe. The offer includes electric collars, training and anti-barking collars, GPS collars and invisible fences from well-known manufacturers in China, France, Belgium, Korea and USA. "I found this shop accidentally. I like the clarity of design of the website, excellent communication and a list of personnel who are able to advise you. I would definitely recommend it! " "Enough goods at low prices, the possibility to return the goods within 30 days without giving any reason, friendliness of staff, immediate response from the staff at the inconvenience." "Very politely they advised me over the phone. They dont do it to sell the most expensive product, but for the customer satisfaction. Praise them for the professional attitude and willingness. " "Absolutely great communication, they are experts. Product works greatly and I am fully satisfied. I will be ordering more electronic fences for dogs. " Why are the opponents of electronic collars wrong? GPS collars and locators for dogs - how to choose the right one? You will have overview about status of your order. Collect points and earn discount for next order. First of all you will know about discounts and competition.